Symptoms of food-induced anaphylaxis in infants are much less severe than in toddlers and older children, according to a study from Ann & Robert H. Lurie Children's Hospital of Chicago published in the Annals of Allergy, Asthma and Immunology. Anaphylaxis is defined as a reaction that involves multiple systems in the body or a presentation with significant cardiac or respiratory symptoms. While in older children an allergic reaction to food can be life-threatening, anaphylaxis in infants mostly manifests as hives and vomiting, the study found. With over 350 cases analyzed, including 47 infants, this is the largest study to date to describe food-induced anaphylaxis in infants under 1 year of age compared to other age groups. "We found that infants, unlike older children, have a low-severity food-induced anaphylaxis, which should come as reassuring news to parents who are about to introduce their baby to potentially allergenic foods like peanuts," says lead author Waheeda Samady, MD, from Lurie Children's, who also is an Assistant Professor of Pediatrics at Northwestern University Feinberg School of Medicine. "Since early introduction of peanuts is now encouraged by national guidelines, it is understandable that parents might be fearful of triggering a serious reaction." The latest guidelines from the National Institute of Allergy and Infectious Diseases, released January 2017, recommend that infants be introduced to peanut-containing foods between 4 and 6 months of age. These guidelines are a major shift from previous recommendations to avoid early introduction of peanut-containing products. 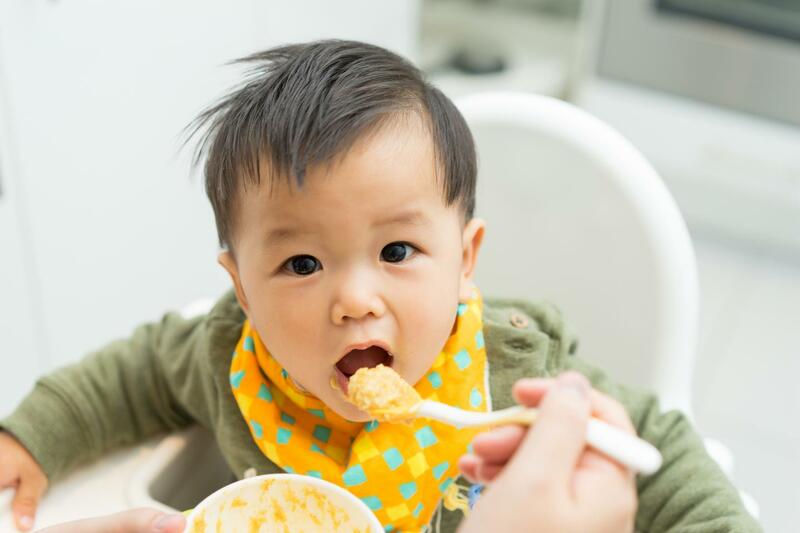 The current guidelines are based on a study demonstrating that early peanut introduction to high-risk infants significantly decreased their risk of developing peanut allergy. To describe food-induced anaphylaxis in infants, Dr. Samady and colleagues conducted a retrospective review of children who presented with this condition at the Lurie Children's emergency department over a two-year period. Their analysis included 47 infants, 43 toddlers, 96 young children and 171 school-aged children. They found that infants presented with gastrointestinal symptoms more frequently than any other age group (89 percent of infants vs. 63 percent of toddlers, 60 percent of young children and 58 percent of school-aged children). Vomiting, in particular, was present in 83 percent of infants. Infants and toddlers also presented with skin involvement more often than school-aged children (94 percent in infants and 91 percent in toddlers vs. 62 percent in school-aged children), with hives as the most common skin manifestation found in 70 percent of infants. Any respiratory symptoms including cough were more common in older age groups (17 percent in infants vs. 44 percent in young children and 54 percent in school-aged children). Only one infant in the study presented with wheezing. Low blood pressure also was present in only one infant. No infant in the study died from anaphylaxis. "If a baby develops only a mild rash or gastrointestinal symptoms after trying a new food, we advise parents to discuss this reaction with the child's physician," says senior author Ruchi Gupta, MD, MPH, from Lurie Children's, who also is an Associate Professor of Pediatrics at Northwestern University Feinberg School of Medicine. "If there are multiple symptoms, make sure to call 911 and get emergency help immediately." Dr. Gupta is the Mary Ann and J. Milburn Smith Research Professor for a Sr. Scientist in Child Health Research at the Stanley Manne Children's Research Institute at Lurie Children's. She also is Director of the Science & Outcomes of Allergy & Asthma Research (SOAAR) Program based at Lurie Children's and Northwestern University Feinberg School of Medicine.